A barn swallow (Hirundo rustica) is a small, sparrow-sized bird that has a shiny and steely cobalt-blue color on its back, wings and tail to contrast its orange-brown underparts. The barn swallow can mostly be found in rural areas and is quite adaptable, feeding in open habitats from fields, parks and meadows to marsh lands, fresh water and coastal waters. The insect-eaters are also adaptable in their foraging abilities as they can feed on different flies and bugs near ground surfaces or hundreds of feet above sea level. When it comes to nesting, they prefer human-made structures, like barns, and build resting spots in eaves, rafters, cross beams or within undersides of bridges, wharfs and other water structures. In fact, people can benefit from these swallows if they encourage these colorful, insect-eating birds to nest inside their sheds, barns or excess structures by leaving a door open. 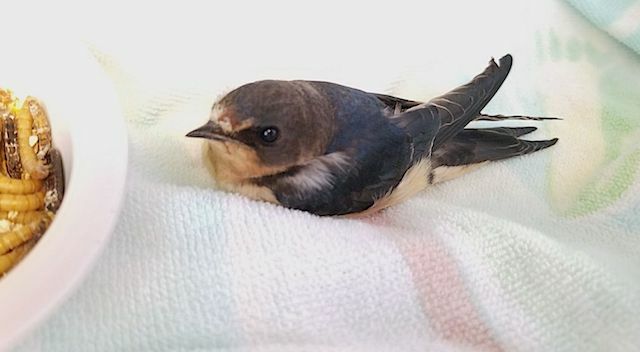 At CROW, an adult barn swallow was admitted from Dunbar Middle School in Fort Myers after it was reported to have struck a window. Upon intake exam, veterinarians found the bird was unable to stand due to hind limb paresis, but was bright and alert on the front end. The patient was propped up for comfort reasons. “If a patient is unable to stand, it is either propped up in a makeshift nest – made out of a folded towel – so it is resting comfortably, or larger birds are sometimes placed in a sling for a few hours each day to assist with standing,” explained Dr. Robin Bast, CROW staff veterinarian. Further examination showed the patient had intact motor ability of the legs, but the left limb was weaker. Without x-rays, CROW medical officials determined there were no fractures palpated. The patient was found to have an increased breathing rate after being handled for a short time. It was given pain medication and placed in an oxygen chamber. CROW’s treatment plan included neurological checks of the patient’s hind limbs and hourly feeds by the rehabilitation staff. After approximately one week at the clinic, the barn swallow did not show signs of improvement. “Unfortunately, the bird’s neurologic condition declined despite supportive care and, due to its grave prognosis for recovery, it was elected to humanely euthanize the patient,” added Dr. Bast.